My first experience with the show started with all the traffic that my wife and I had to wait in before we could park the car. But the Sunday weather was perfect for a concert where the grass was our seat. While in the process of parking I let a burst of frustration spill over on my wife, almost ruining the good mood. But knowing when to apologize is something very valuable in a marriage. From the car to the front gate a buzz was in the air, and not just from the music. People were still drinking out in the parking lot, scalpers were trying to sell expensive tickets, and what's that funny smell in the air? Our tickets were scanned and BAM we are in. Making our way to the lawn to pick out our position for the night was my first priority. I scurried hastily to mark my territory while I still could, but the lawn was already flooded with arms and legs and whatever else people decided to bring. The opening band, The Liars, were nothing to speak of. 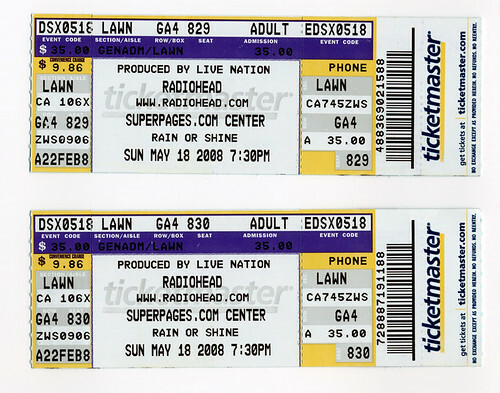 Maybe their music is good, I've never had a listen, but my anticipation for Radiohead drowned them out. While waiting I went to get us food and drink and to get some pictures. The food was Papa Johns pizza, but it looked more like Pizza Hut, disgusting. Good thing I brought some kashi go-lean crunch bars to hold me over. Finally the opening act went off about 8:17 and the sky dipped further into darkness above us. Between 8:30 and 9:00 I was on my feet waiting for the first sign of any real band members on stage. But you know it's a good sign when the lights go out, and just before 9 the crowd went crazy. Needless to say it was all too amazing. I only wish I could have been right up front. But it will always be etched in my memory as one of the greatest shows.